While we were out today I spotted a sked holder full of 2010/2011 Langley Chiefs pocket schedules at an Arby's restaurant. This is the first hockey schedule I have seem this season. I guess this means its time to start sending out those sase's to all the teams again, and to start hitting all the local arenas looking for schedules. The BCHL hockey season actually started already, but I didn't manage to make it to any of the home openers last week. I am hoping to make it to the Coquitlam Express home opener next weekend. 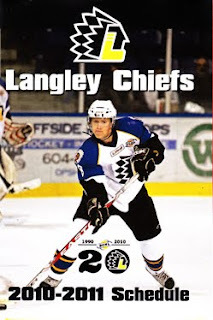 The Express originally played in Coquitlam but moved to Burnaby when the Burnaby Bulldogs moved to Port Alberni. I guess the Express found the same lack of enthusiasm that forced the Bulldogs to leave town. And from what I have seen on the Express web site, it looks like they have done lots of work on the arena and the rest of the complex around it, so it should be a fun game to attend!